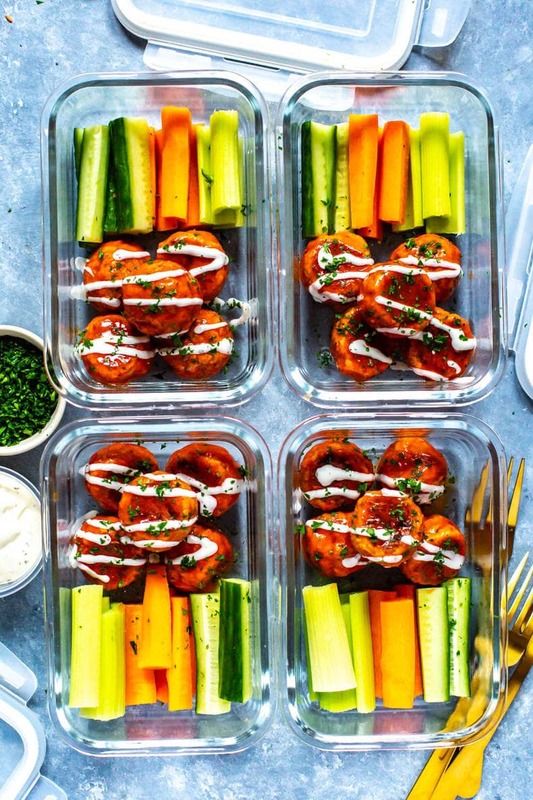 These Meal Prep Buffalo Chicken Meatballs are freezer-friendly and a tasty, healthy way to celebrate football season - they're also the perfect party food! Preheat oven to 400 F. Mix together ingredients for meatballs, then form into 1-inch balls and place on a parchment-lined baking sheet. Bake for 25 minutes until fully cooked in the center. Remove meatballs from the oven and allow to cool for 5 minutes. Toss with 3/4 cup of buffalo sauce in a large bowl, then divide among meal prep bowls and add in veggies and containers of dressing. Drizzle meatballs with ranch and garnish with parsley if desired. Meal prep bowls will keep in fridge up to 5 days - serve and enjoy! Note: you can make these meatballs up to 3 days ahead of time for parties/potlucks. Make the meatballs and store in the fridge, then reheat in a 350 F oven for 10-15 minutes and toss in warmed up sauce when ready to serve.